Single-portal Endoscopic Surgery is a minimally invasive procedure that reduces post-operative pain by avoiding an open incision extending from the wrist across to the palm. Endoscopic Surgery is highly effective and has been used for more than 20 years. It results in less post-operative pain, a minimal scar concealed by a wrist crease, and generally allows patients to resume some normal activities in a short period of time. We provide Platelet rich protein (PRP) injections for select patients where it has been determined to be beneficial. PRP is obtained from a simple blood draw in the office, and includes numerous growth factors to promote healing. Please ask your doctor for more information. These injections may not be covered by your insurance. Surgical alternatives are available for ganglion cysts if non-surgical options fail to provide relief or if the cyst recurs. Surgery involves removing the cyst along with a portion of the joint capsule or tendon sheath. Surgical treatment is generally successful although cysts may recur. Your surgeon will discuss the best treatment options for you. If non-surgical treatments do not relieve the symptoms, surgery may be recommended. 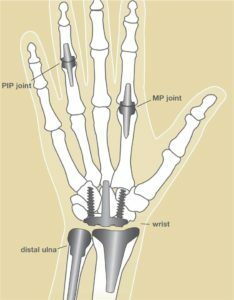 The goal of surgery is to open the pulley at the base of the finger so that the tendon can glide more freely. This can sometimes be done as a percutaneous procedure in the office with local anesthesia. The clicking or popping goes away first. 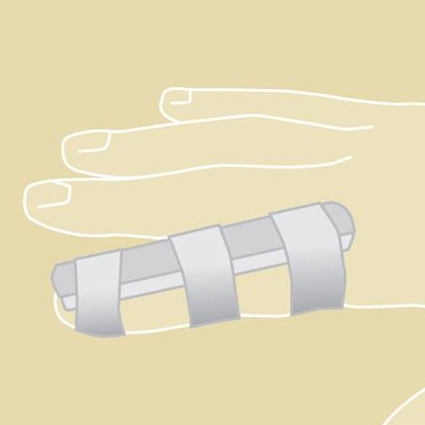 Finger motion can return quickly, or there can be some stiffness after surgery. Occasionally, hand therapy is required after surgery to regain better use. The loss of a body part, especially one as visible as a finger or hand, can be emotionally upsetting. It may take time to adapt to changes in your appearance and your ability to function. Talking about these feelings with your doctor or other patients who have had this condition often helps you come to terms with your loss. You may ask your doctor to recommend a counselor to assist with this process. It is important to remember that with time, you will adapt to your situation by finding new ways of doing your daily activities. The Amputee Coalition of America www.amputee-coalition.org/index.html is another helpful resource. These resources can help you to be strong during the course of recovery. Remember that quality of life is directly related to attitude and expectations – not just obtaining and using a prosthesis. 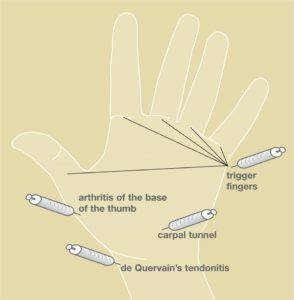 © 2011 American Society for Surgery of the Hand. A warm shower or bath can help sore, stiff joints, especially in the early morning. A warm compress or heating pad can also relieve stiffness (Figure 1); however, too much heat could cause fainting, swelling, or burns to skin and tissues, so use heat treatments with moderation. The most common cold treatments are ice or something that has been made cold by placing it in the freezer, such as a gel pack (Figure 2). Apply ice for 15 minutes, then allow a 15-minute rest before reapplying. In a joint replacement, the abnormal bone and lining structures of the joint are removed surgical-ly, and new parts are inserted in their places. These new parts may be made of special metal or plastic or specific kinds of carbon-coated implants. The new parts allow the joints to move again with little or no pain. Finger joints (called PIP), knuckle joints (called MP) and wrist joints can all be replaced (Figure 1). In a normal joint, bones have a smooth surface made of a substance called articular cartilage on their ends that allows one bone to glide easily against another. Joints are lubricated by a thin layer of fluid (synovial fluid) that acts like oil in an engine to keep parts gliding smoothly. When the articular cartilage wears out, is damaged, or the joint fluid is abnormal, problems develop, and joints often become stiff and painful. This is arthritis, which may be possible to treat with this procedure. Therapy supervised by a trained hand therapist is almost always required after any joint replace-ment surgery, usually for several months. Special splints are generally used depending on which joint was replaced and how the surgery was done (Figure 2). To ensure the best results after surgery, follow your surgeon and therapists’ directions, call your surgeon if you experience a sudden increase in pain or swelling, and call your surgeon if your hand or wrist becomes red, hot or crooked. Call your surgeon or therapist if you have specific questions about your new joint(s). Opioids are a type of pain medication made from the poppy that is used to make opium and heroin. People have used them to treat pain for thousands of years. They are effective for treating acute pain involving skin, muscle, or bone and joint pain in the first several weeks following injury or surgery and are less effective for treating chronic pain, headaches or nerve pain. They are sometimes used to treat cancer pain at the end of life. Some of the most common such pain relievers used today include hydrocodone, oxycodone, hydromorphone, tramadol and codeine. Over the last 15 years, the prescription of this medication has increased tenfold. Misuse now kills more than 100 people each day in the United States. It is responsible for more deaths than both suicide and motor vehicle collisions combined. According to the Food and Drug Administration (FDA), nearly 16,000 Americans died from overdoses involving these pain relievers in 2009. Most of these deaths were accidental. Pain is expected after injury or surgery, and mindset matters. Pain relievers cannot take pain away; they just make the pain less bothersome. Patients quickly develop tolerance to these drugs, which means it requires more medicine to achieve the same amount of pain relief as time goes by. This is why such pain relievers work well in the short term, but do not work for long-term chronic pain. These pain relievers are sometimes used by patients or their friends to get high. Over half of the teens abusing these medicines get them from family or friends without their knowledge. In addition to potential poisoning, recreational use creates addiction. One study of heroin users found that 39% of addicts reported being “hooked” on prescription pain relievers first. The most common side effects of these drugs are nausea, constipation, itching and drowsiness. The most serious effect is a decrease in breathing, which can result in death. The chance of death can increase when pain relievers are used together with alcohol or other drugs that make you sleepy. The progress of your treatment and your medication needs should be discussed with your providers, including your surgeon, physician assistant and nurse. While your providers want to limit pain following surgery or injury, they also understand the risks of abuse, addiction and possibly death associated with the use of these medicines. To reduce these risks, your provider may suggest switching to over the counter medicines such as ibuprofen or ancedimenifin once the initial intense pain subsides. These pain relievers should be disposed of when they are no longer needed to treat the injury or surgery for which they were originally prescribed. Studies report that between 10% and 30% of these pain relievers sold go unused. Leftover pain medicines kept in a patient’s home increase the risk of accidental poisoning and drug abuse. These tragedies often affect family members or friends. 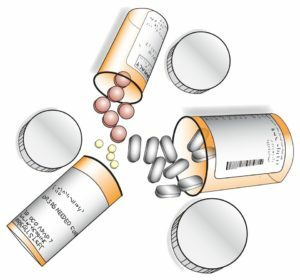 Many communities have organized ways to dispose of unused pain relievers. Some law enforcement agencies have drop boxes or hold designated dates to collect unused prescription medicines. Do not flush the pills down the toilet because it releases the drugs into the waterways. Water treatment facilities do not effectively remove these dissolved drugs, so contamination of drinking water is a growing concern. 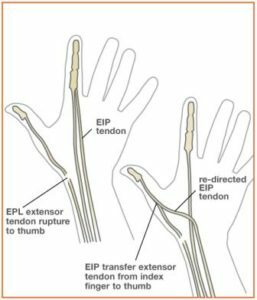 Replantation is the surgical reattachment of a finger, hand or arm that has been completely cut from a person’s body (Figure 1). The goal of this surgery is to give the patient back as much use of the injured area as possible. This procedure is recommended if the replanted part is expected to function without pain. In some cases, a replant is not possible because the part is too damaged. If the lost part cannot or should not be reattached, your surgeon may offer to clean, smooth and cover the cut end. This is called a completion or revision amputation. In some cases, this option will give you a better and faster recovery than a replant. There are a number of steps in the replantation process. Avoid smoking, as it may cause loss of blood flow to the replanted part. Keep the replanted part above heart level to increase circulation. Age. Younger patients have a better chance of their nerves growing back. They may regain more feeling and movement in the replanted part. Area of injury. Generally, more use will return to the replanted part if it is further down the arm. Joint vs. non-joint injury. More movement will return for patients who have not injured a joint. Severed vs. crushed body part. A cleanly severed part usually regains better function after replantation than one that has been pulled off or crushed. Weather. Cold weather may be uncomfortable during recovery, regardless of how well your recovery is going. Use of the replanted part depends partially on re-growth of two types of nerves: sensory nerves that let you feel and motor nerves that tell your muscles to move. 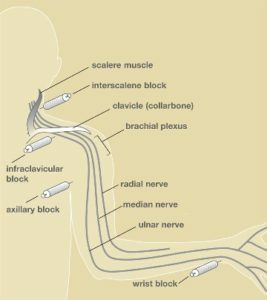 Nerves grow about an inch per month. 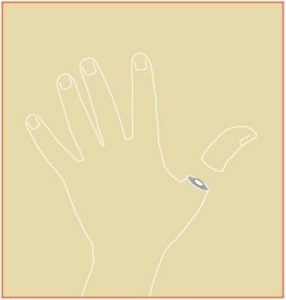 The number of inches from the injury to the tip of a finger gives the minimum number of months after which the patient may be able to feel something with that fingertip. The replanted part never regains 100% of its original use, and most doctors consider 60% to 80% of its original use an excellent result. Physical therapy and temporary bracing are important to the recovery process. From the beginning, braces are used to protect the newly repaired tendons but allow the patient to move the replanted part. Therapy with limited motion helps keep joints from getting stiff, helps keep muscles mobile, and helps keep scar tissue to a minimum. Even after you have recovered, you may find that you cannot do everything you wish to do. Tailor-made devices may help many patients perform special activities or hobbies. Talk to your physician or therapist to find out more about such devices. Many replant patients are able to return to the jobs they held before the injury. When this is not possible, patients can seek assistance in selecting a new type of work. If you have completed an amputation, therapy and rehabilitation also play a large part in recovery. For the missing part, a prosthesis may be worn (a device that substitutes for a missing part of the body). Replantation or amputation can affect your emotional life as well as your body. When your bandages are removed and you see the replanted or amputated part for the first time, you may feel shock, grief, anger, disbelief or disappointment because the body part does not look like it did before. These feelings are common. Talking about these feelings with your doctor often helps you come to terms with the outcome. Your doctor may also ask a counselor to assist with this process. An active scar may be red, raised, firm, and thick. Scar tissue may involve only the superficial skin, or it may involve the deeper tissues beneath the skin, including nerves and tendons. Scar formation is a normal response following any injury or surgery; it is the way the body heals injured structures. Scars can become overly sensitive and can limit motion and function. Scar massage: Can help reduce sensitivity and loosen any adhesions to deeper structures, especially tendons and joints. Scar massage helps to produce a scar that is smooth and moveable. Early controlled exercise programs: Can prevent stiffness of nearby joints and keep tendons gliding under the skin. Silicone gel: Can be placed on the scar in sheets or in liquid form for adults (often at night), and taping/wrapping of the scar can help reduce swelling and tension. Massage, vibration and rubbing the scars with various textures: Can help overly sensitive scars, which occur when the nerves in the skin and deeper tissues are affected by the injury or surgery. The scar may also be submerged in various slightly abrasive particles. The goal of this treatment is to reduce scar sensitivity and to help the skin and nerves become tolerant of the normal forces of everyday living. This process of “desensitizing” the scar can take up to 4 months and is best initiated as soon as the skin and repaired tissues have adequately healed. Injections or surgery: Can be effective for special scar problems, such as burn scars/contractures or keloids that require more vigorous treatment. 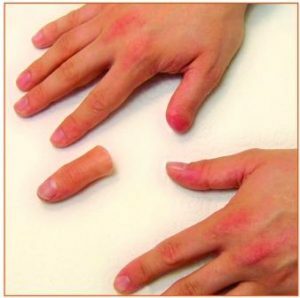 Special gloves or topical treatment may be recommended for burn scars. Some scars take up to a year to become completely mature. Therefore, some scar revisions may not be offered until a year after injury/surgery. Scars have completed the healing process when they are light in color, smooth, supple, and no longer sensitive to touch. While scars are young and in the healing phase (pink, red, raised, thick, and sensitive) they should be protected from the sun as sunlight can damage the fragile scar and ultimately darken its color. By the time the skin heals within seven (arm/forearm) or 10-12 days (hand/fingers), the first two stages have already taken place. Although the initial skin scar may be minimal, the scar will often enlarge and become more reddened over the following 4-6 weeks. An active scar is typically red, raised, firm and thick. Sometimes this change is misinterpreted by the patient as a possible infection. However, with a normally healing wound, there is no drainage or blistering. The outermost layer often loosens with the deeper layers remaining intact and, while this can give the appearance of “opening up,” it is normal. Following the swelling/reddening phase, the wound gradually reduces in size and color over the next 2-3 months (Figure 1). Later, the scar becomes soft and has a more natural color in most individuals. Figure 1: Example of this surgery. In the last five years, the wrist (Figure 1) has become the third most common joint to undergo arthroscopy, after the knee and shoulder. Because the cuts used with this procedure are smaller and disrupt less soft tissue than typical surgery, pain, swelling and stiffness are minimal, and recovery is often faster. Your doctor can see the ligaments and cartilage surfaces of bones with wrist arthroscopy. Some parts of ligaments have a good blood supply and can be repaired and heal, whereas other parts do not have a blood supply and don’t heal, so they are removed. 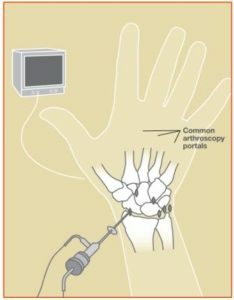 During the procedure, a small camera fixed to the end of a narrow tube is placed through a small cut in the skin directly into the back of the wrist joint (Figure 2). The image is projected onto a television screen for better viewing. Several small cuts are used to allow the surgeon to place the camera in a number of positions to see the cartilage of each bone, the ligaments and the joint lining called synovium.